I wish I could eat this sweet treat every day. I mean EVERY day, with breakfast, lunch and dinner. It's filled with cognac soaked prunes and raisins, and has a creamy, smooth dense texture, somewhere between a clafoutis and a flan. Unlike either of those desserts, you can eat a slice of far with your hands, making snacking on the sly much easier. This is so easy to make. The batter whips up in the blender, and then you refrigerate it for a few hours or overnight. I came across the recipe for the far ages ago in Bon Appetit in an article titled When French Women Bake. According to friends who are from the Breton region, this is the real deal! 1] Follow the recipe instuctions and use an 8" dia. pan w/2" sides. I ignored this and used a pan with only 1" high side, and the cake collapsed to the outside of the pan, not pretty. When a friend made this, she used a springform pan and the batter leaked out the bottom. And yes, do line the bottom with parchment paper. 2] Don't be afraid to use all the prunes and raisins. It seems like a lot when you are adding them in, but they really add flavor and nice texture to the far. You can't really have too many, but you can easily have too few. I've missed writing and sharing on the blog. I hoped last year there would be more focus for Fiddlesticks & Nonsense. Instead of figuring out what that could be, I abandoned the site altogether. So, I'm back…again…thanks to encouragement from family and friends. Honesly, the biggest kick-in-the pants I neeeded to post again was the tiniest mention in Martha Stewart Living magazine thanks to my cousin-in-law, Jessie Randall. She is a kindred crafter and designer, and her annual Valentine Sock Hop she throws for her boys and their friends is featured in the current issue of MSL. Jessie made Brownie Burgers for the Sock Hop, and she was sweet enough to mention that she borrowed the idea from F&N. Thanks again Jessie! D had a birthday last month. It was a small celebration with two friends. What D wanted more than anything [besides Bobba Fett's lego ship] were hamburger cookies. It's a fake-out food, it looks like one food, but it's really something else. I was skeptical at first, but when I read the instructions I was up for the challenge. These were really easy. I made the brownies using my regular brownie recipe. You'll find it on the back of the Ghiradelli sweetened powdered chocolate, and it makes the BEST brownies. Oddly, cookies are my least favorite thing to bake. So, I bought some wonderful pre-made pumpkin cookie dough at Whole Foods and that saved the whole project. Just sprinkle some sesame seeds on top before you bake for instant "buns". 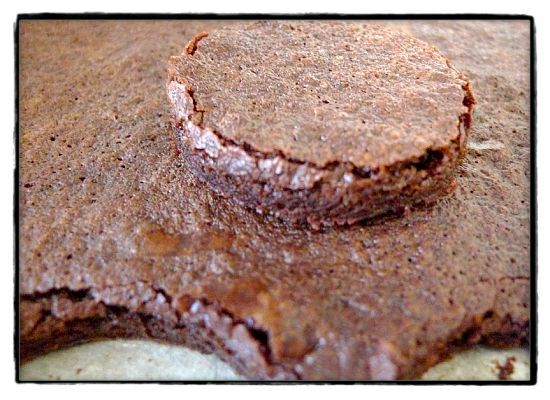 2] Bake your brownies in a larger pan, I used about a 9 x 12, so you'll get thinner brownies and more realistic patties. I was nervous about doing this because the batter barely covered the bottom of the pan, but it worked. Make sure to adjust your baking time! 3] If you're ambitious or just like to bake cookies, the original recipe calls for peanut butter. I think the peanut butter would compliment the brownies perfectly. 4] Go crazy with condiments! The cookies and brownies are just fine on their own, but the icing condiments add a lot of fun. I just did ketchup, but you can do pickles, cheese, mustard and lettuce too. 5] I used a 2.5" baking ring to cut the brownies and a generous table spoon of cookie dough rolled into a ball. D and I have been spending a lot of time [and money!] at various Japanese supermarkets. We have such a fun time poking around and looking at the different type of foods, and the packaging is just so darn intriguing. This purchase was all about the packaging! There is debate as to whether this is a lion or dragon, but I think it's a lion. 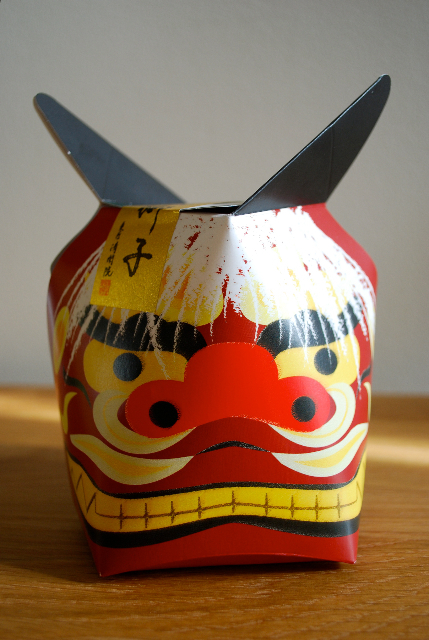 Inside are individually wrapped mochi sweets filled with black sesame paste…yummy! The wrappers are adorable, and I've been saving them all for some yet to be imagined use. Honestly, I'm the one who enjoys eating these. The mochi is just the perfect texture, chewy but moist and soft, and the sesame paste is a nice delicate, sweet flavor. Doc likes the flavor, but he's indifferent to the texture. D just doesn't like them…at all. I've got lots more sweets to share which are all lovely and tasty! Inspired by the recipe on the box, these oatmeal drops are a favorite in the house. 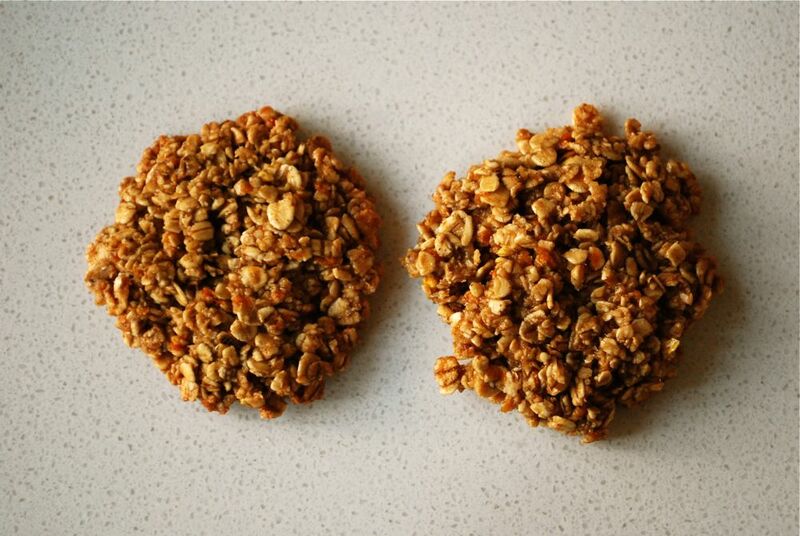 They are easy to make and healthier than traditional oatmeal cookies. 1. Mix all dry ingredients in bowl. 2. Add wet ingredients and zest to bowl. Mix to combine, and let sit for 15 minutes. 3. Place tablespoon size drops onto greased baking sheet [a silpat works great here] and use the back of a spoon to flatten and shape the drops. 4. Bake for 15-20 minutes. I like to bake them until all the edges are brown. Remove and let cool on wire rack. I find that by adding the cinnamon and zest, you can cut back on the brown sugar. 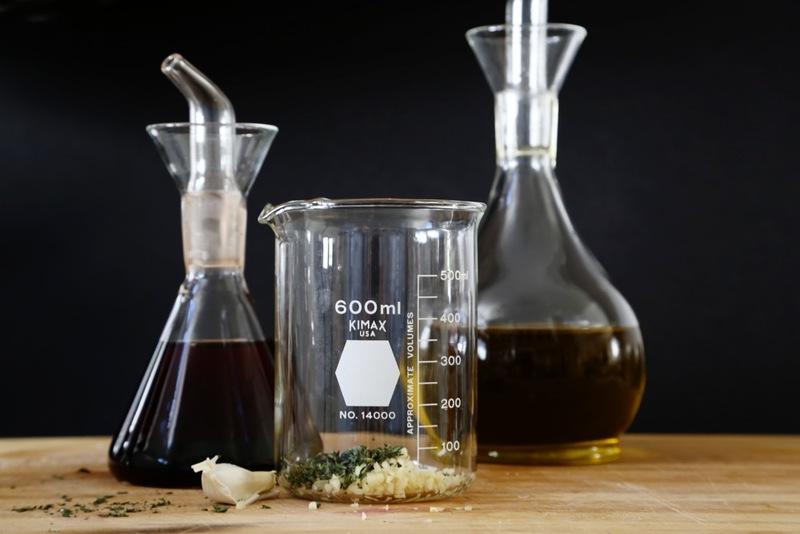 I wouldn't cut back on the syrup as the recipe requires the wet ingredients to stick together. A batch lasts about two days in the house if we're on good behavior. They are perfect for school lunches and after school snacks. Last week we were buried in more apricots from my mom's tree. Remember the first batch? This one little tree puts out so much sweet fruit, I couldn't stand to see it go to waste or to the squirrels. So once again, we were up on ladders filling every box we had with ripe fruit. We picked about forty-five pounds, and there was still a ton of fruit ripening on the tree! In addition to the apricot tree, my mom also has a white nectarine, Santa Barbara plum and lemon trees. The apricot and lemon trees have been there since my childhood, which seems like forever, and the nectarine and plum trees are somewhat newer, their fruit wasn't as abundant, but it was SWEET and YUMMY! 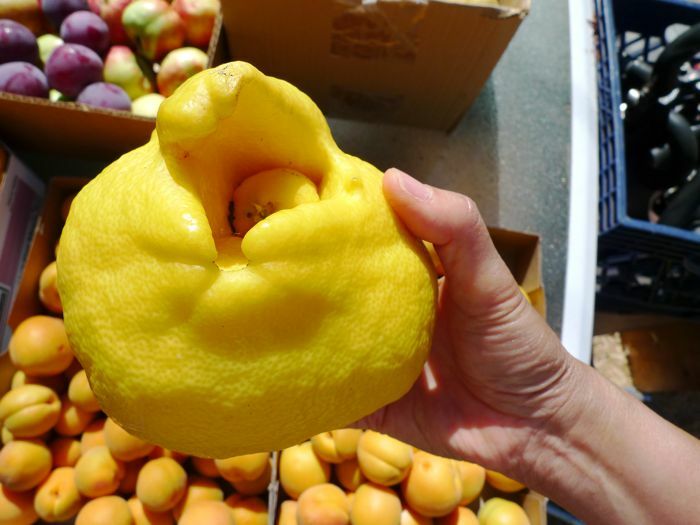 The lemon tree puts out these freaky alien like lemons every so often. Here is the biggest alien lemon to date. Doc called it the eternal lemon because we used it for an entire week. With all these apricots, I had a lot of canning to do. I canned a batch every morning before work and every evening after work for a week. Having all the ingredients and equipment strewn all over the kitchen made Doc super twitchy as he's borderline maniacal about a tidy and clean kitchen, but he was supportive and helpful. D also pitched in by picking and weighing the apricots. In the end, we canned almost 7 dozen jars! 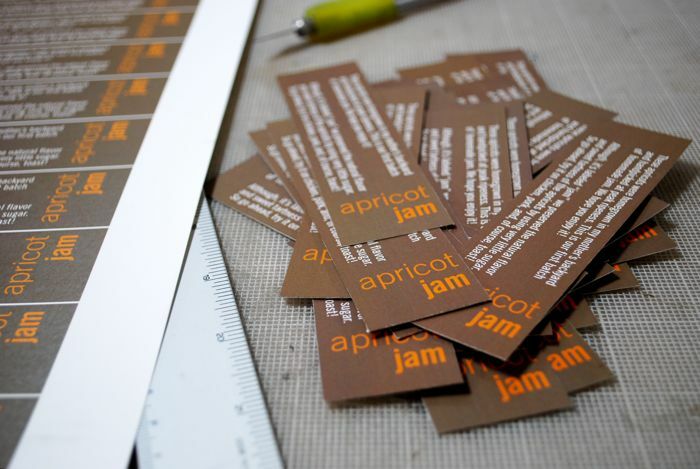 I barely had enough energy, or rather enthusiasm, to crank out some labels. Some of you will be getting a few jars in the mail, so keep your eyes open! 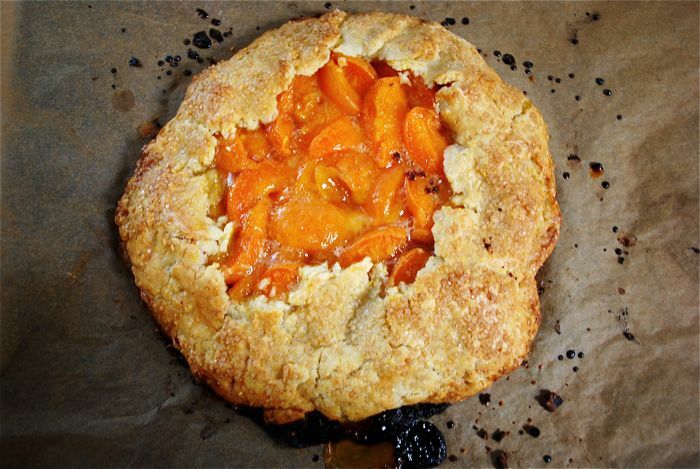 One last thing…I did save a few apricots to make some rustic tarts. These are so easy to make, especially if you make the pate brisee the day before you intend to use it. The added cornmeal to the crust add to the rustic quality. 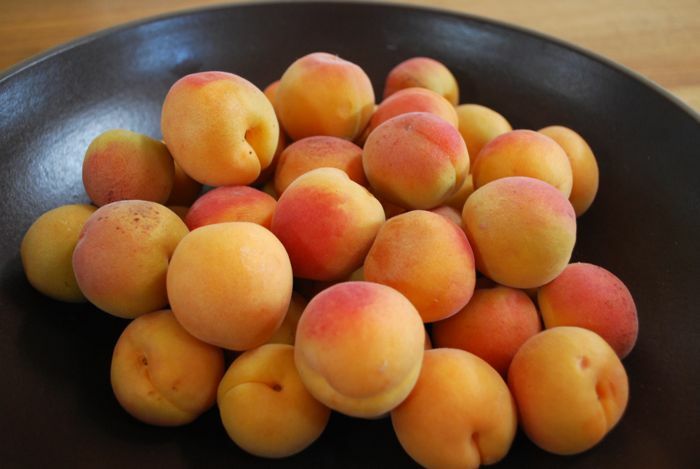 Summer has finally arrived and here is the proof…yummy sweet, juicy apricots from my mom's tree! When we picked our first harvest, I imagined baking tarts, pies and more upside down cake, but for whatever reason, no baking occurred. The little gems did not go to waste as we snacked on them all week and used them in a couscous and shrimp dinner. 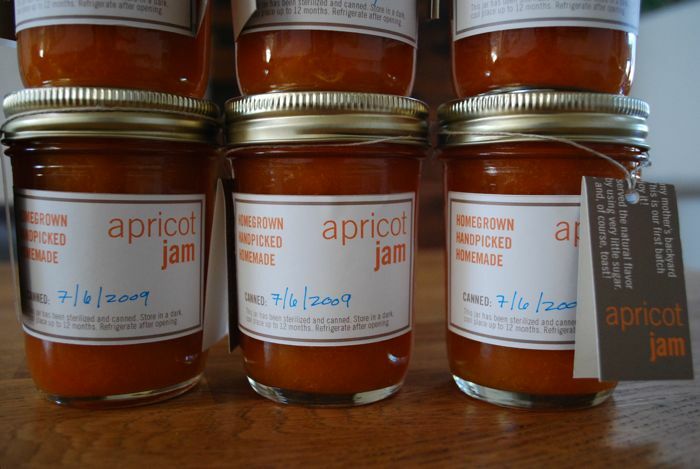 Over the weekend, we picked more ripe apricots, about twelve pounds, and I knew then that I was going to make preserves with this harvest. I've always wanted to make fruit preserves, but I never had an abundance of fruit on hand and was intimidated by the boiling and sterilizing process. With some on-line research, I found a recipe and canning instructions and decided to give it a go. I am quite pleased with this recipe and process. Because the apricots were so juicy and some overripe and I wanted to taste the tartness of the apricots, I cut the sugar way back. The original recipe calls for 6 cups of sugar to 4 pounds of apricots. I used 2 cups and that was plenty. The apricots and sugar are mixed together and left in a bowl overnight to macerate then transferred to a pot to simmer until it thickens. 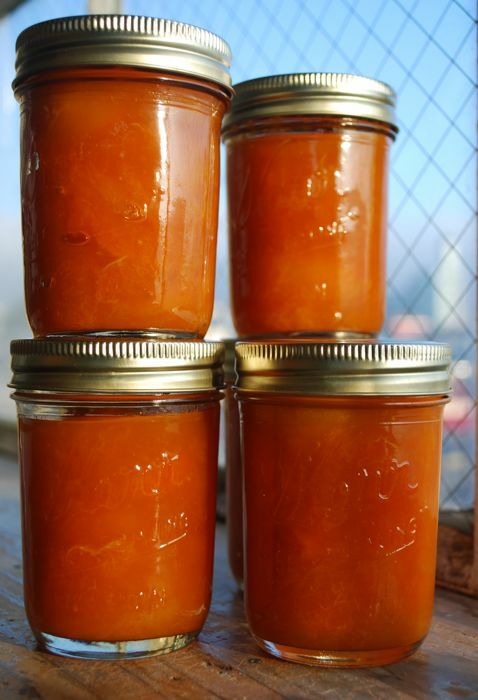 I liked macerating the apricots for two reasons: 1] you can control the amount of sugar and gauge the sweetness, and 2] I try to avoid boiling water and sugar unless I'm making caramel or flan because it ALWAYS burns. Now, I need to make some labels and find homes for these tasty preserves! NOTE: I didn't buy any special equipment, aside from the jars. These rubber tipped tongs made it possible to pull the jars out of the hot water and fill them with the apricots. It's an awesome tool.